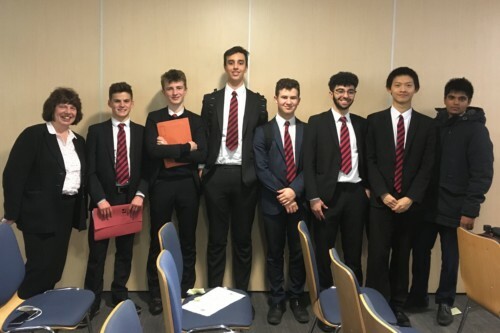 On Friday 22 March 7 L6 pupils engaged in high-powered debating on a range of controversial topics relating to the EU in the Yorkshire and Humberside regional heat of European Youth Parliament competition at St George’s Conference Centre in Leeds. Barnaby De La Billiere, Rafal Faraj, Oliver Flint, Alex McGlone, Ultan Norris, Satyam Verma and Siqi Yu wrestled with issues as diverse and relevant as security of online voting; climate change and the return of colonial artefacts. Head to head with Wales High School, all our delegates had chance to address the floor from the podium delivering a range of eloquent attack and defence speeches together with a number of pertinent summation speeches. At the end of the competition the team were commended by the jury for the excellent quality of their public speaking and were selected as the winners to go forward to the National finals at Liverpool Hope University in June 2019.